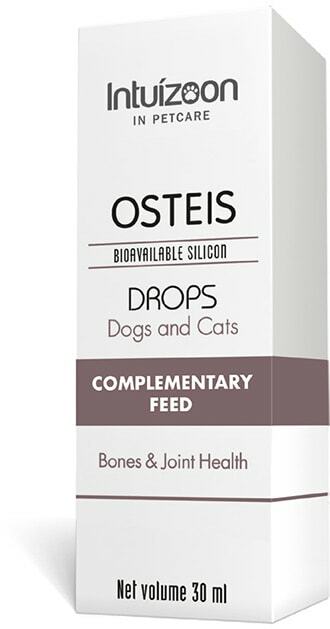 Complementary feed for dogs and cats in the form of drops used for Silicon (Si) supplementation aiming at maintaining healthy bones, teeth, nails, joints and ligaments. A low-silicon diet can lead to bone defects. Research has revealed that silicon supplementation may aid in increasing bone mineral density (BMD) and reducing bone fragility. Orthosilicic acid has been found to act by stimulating collagen type 1, which is the most important in tendons, ligaments and skin. Easy administration. To be used in accordance with veterinary advice. FEEDING INSTRUCTIONS and DAILY RATION for DOGS: Add the daily ration of OSTEIS in the drinking water of your dog. Every time before adding a new ration of OSTEIS, change water in the bowl. FEEDING INSTRUCTIONS and DAILY RATION for CATS: Add the daily ration of OSTEIS on your cat’s food.